Jeannette and Edwin Cruz are the owners and administrators of Preferred Care at Home, servicing the Princeton, Somerset and Flemington areas in New Jersey. Jeannette’s home care experiences began at a very young age when she accompanied her grandmother on home visits to the bedridden members of her home church. Jeannette was given the “lighter” duties of fetching a glass of water, folding laundry, and reading the Bible. Grandma taught Jeannette that the purpose of the home visits was to help with any immediate (non-medical) care needs, but more importantly to bring a smile to their face and warmth to their heart. Jeannette earned her stripes while working in the childcare industry for the past 13 years as an assistant director. Previously, she worked in the telecommunications industry. She is very busy as a mother of five, church leader, counselor, and confidante to many, but in her “down time” she enjoys a night of salsa dancing, reading, good movies and fashionista shows on TV. Edwin has a background in the corporate finance industry. He has been particularly intrigued by the reforms in the healthcare industry—which brought him to Preferred Care at Home. Edwin is an avid boxing fan and a former amateur boxing referee with USA Boxing, the Olympic feeder system. He enjoys salsa dancing with Jeannette, interstate road trips, and spending quality time with his family and friends. 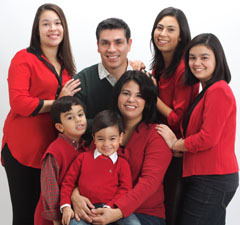 Edwin & Jeannette live in Hillsborough, NJ just outside of Princeton, with their children Marrissa, Raquel, Graciela, Gabriel, Javier and their Holland Lop bunny, Flik.